Myra loved her job as a salsa dance teacher. Each morning, she left her three children in their apartment to twirl, tap, and dance. However, she dropped everything and left her job when she learned that her oldest daughter had been raped by the apartment’s janitor. Myra now refuses to leave her children alone, no matter what the cost. 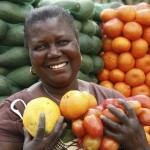 Through a WAR, Int’l micro-loan, she is able to run a food stand selling empanadas. She is privileged to be with her children as she makes a living. She has a love greater than dance: her children. However, she is using her passion and skills by starting a salsa aerobics class with the help of WAR Int’l’s partners.